Luther | what would henry do? 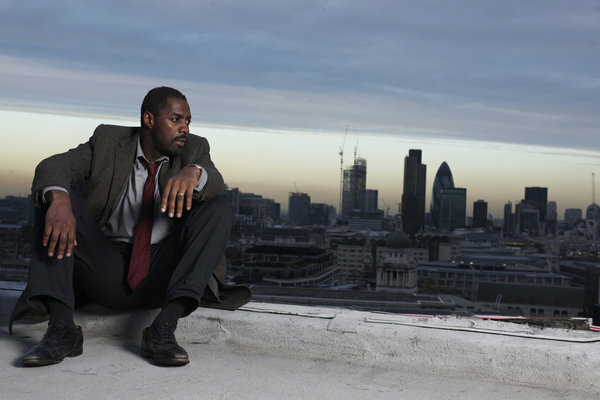 I’ve recently become enamored of the BBC crime drama Luther, starring Idris Elba (Stringer Bell from David Simon’s The Wire, and another in a long line of Brits pretending to be Americans and fooling us all. Andrew Lincoln, are you listening?) The series, now streaming on Netflix, is beautifully photographed, deftly plotted and brilliantly written. It’s also emotionally gut-wrenching, occasionally gory, and borderline psycho in a Silence of the Lambs kind of way. But what I’ve really zeroed in on lately is Luther’s sparsely-decorated bachelor pad. His bed is on the floor in the middle of the room. His windows have no curtains, allowing his psychopathic, part-time sidekick to peer in from a building across the alley. His closet appears to be a wheeled garment rack hung with perhaps three outfits, all in the same drab grey. I think he might have a microwave stashed somewhere, and a few teacups. In the four episodes I’ve watched, although Luther has slept a few times (and at least once with his ex-wife), he doesn’t appear to have ever changed his clothes. Strange to say that what his fictional apartment represents to me is actually a real vision of my retirement, minus the detective work. You won’t see me on the golf course or taking flying lessons in my old age. Probably all my wife and I will be able to afford is a one-room studio in some hip city somewhere, where we’ll keep our futon rolled up against the wall during the day, and where the kids, although we love them dearly, won’t be able to come home to roost for any extended period of time unless they bring a sleeping bag, a camping pad and a generous honorarium. Our virtual urban cabin will be close to the library, park, and gym, and within an easy drive of the forest and the ocean. What we will save on landscaping we will put into books, food, and wood-fired saunas. The blades of our green juicer will always be sharp. A perfect vision of leisure. And I’m sure my wife wouldn’t mind if Mr. Elba was there to join us.